The Tamerica TW2100 2:1 Wire Binding Machine can punch, bind and close legal sized twin loop wire. Those capabilities combined with its lower price point help to make it one of our most popular units. The Tamerica TW2100 lets you manually punch, wire bind and close booklets with the same machine, saving you time and valuable work space. The dual-handle design not only protects the punching dies, but also allows you to place the unit right up against the wall, another great space saver. 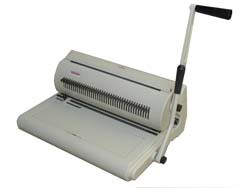 The Tamerica TW2100 2:1 Wire Binding Machine costs $319 at Lloyd’s and comes with a 1-year warranty from the manufacturer. You can opt to purchase an extended warranty from Lloyd’s of Indiana for 15% of the purchase price for a 2-year warranty or 20% of the purchase price for 3 years. For more information on the Tamerica TW2100 2:1 Wire Binding Machine or to place an order, please visit the Lloyd’s website. Previous Post:Why Should I Put UV Coating on My Trade Show Posters?